Doug Jones was offered a cameo in Neil Marshall's upcoming Hellboy reboot. However, the actor had to turn the role down. 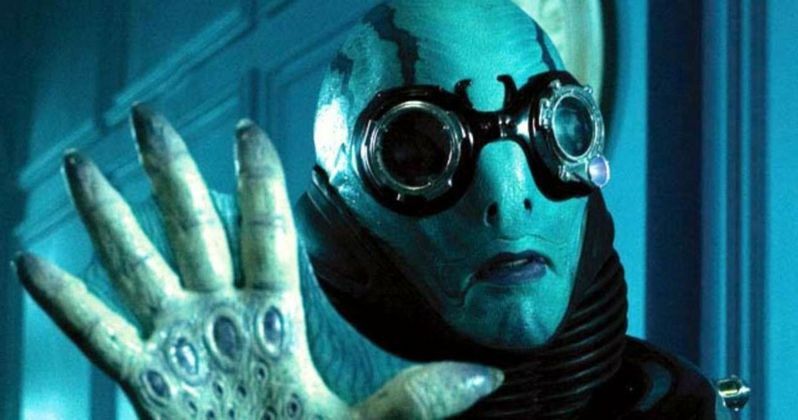 Jones portrayed Abe Sapien in Guillermo del Toro's two original Hellboy movies and currently stars as alien Lt. Saru on CBS All Access' Star Trek: Discovery. The reboot has been a hot topic of debate ever since it was announced, with many fans angry that the studio didn't let Ron Perlman and del Toro make the third movie, which was in various stages of development. Since Doug Jones has worked with Guillermo del Toro many times in the past, one could easily see him turning down a cameo in the Hellboy reboot on principle alone. However, that isn't the case at all. "There was a chance that a cameo might have happened, but not as things progressed," says the actor. Jones continued and had this to say about not taking on the cameo role. "Reboot means recasting, and I'm told this first reboot does not have anybody in it from the original film. I received an offer to do a cameo, but I was deeply immersed in Star Trek: Discovery when that offer came in, so I couldn't do it." Doug Jones has worked with Guillermo del Toro six times, including on The Shape of Water, which earned the director two Academy Awards for Best Picture and Best Director. When it comes down to it, Jones is more than likely being polite about his reasons for not taking on the Hellboy reboot cameo. After all, he says that del Toro is his favorite director of all time, meaning that there is probably some allegiance to the director and the work that they created together. The Shape of Water was one of Doug Jones' more demanding roles and he didn't even have to speak. Instead, he was covered in KY Jelly and shoehorned into a rubber suit every day while filming and couldn't open a door, send a text message, or even breathe without a lot of help from outside forces. While the actor isn't into returning for a Hellboy reboot cameo, Jones did reveal that there is another one of his roles that he would definitely like to revisit in the future. Doug Jones portrayed the Silver Surfer in 2007's Fantastic Four: Rise of the Silver Surfer. Laurence Fishburne provided the voice, but Jones admits that he would love to return to the role, revealing that he originally signed on to play the character for three movies, which obviously did not end up happening. However, with Fox Marvel properties heading over to Disney and the Marvel Cinematic Universe, Jones may actually get a shot at playing the iconic comic book character again at some point in the future. You can check out the original interview with Doug Jones over at The Hollywood Reporter.